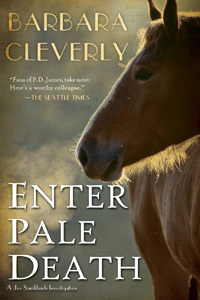 Enter Pale Death by Barbara Cleverly: Synopsis and Online Purchase Options. Synopsis (from the publisher): One morning before dawn in the stables of her country estate, Lady Truelove meets a violent death in an encounter with a dangerous horse. Classified as "death by misadventure," this appears a gruesome accident. But Scotland Yard Detective Joe Sandilands suspects foul play — a misgiving he is struggling to separate from his personal grievances toward Sir James Truelove, who is Lady Truelove's widower and the influential academic patron of Dorcas Joliffe, whom Joe one day hopes to marry. Joe enlists old friend and former constable Lily Wentworth to trail James, and finds an ally in a fellow police officer familiar with the Truelove estate. But as the investigation yields surprising secrets about one of England's most powerful families, Joe discovers how little he knows about not only the gilded lives of the moneyed, but also his relationship with Dorcas. Is Joe prepared to risk a future with the girl he loves to uncover the truth behind Lady Truelove's death?